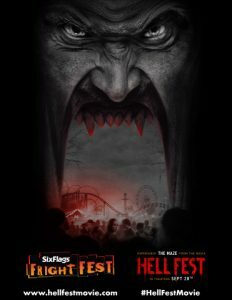 GRAND PRAIRIE, Texas–Six Flags Entertainment Corporation, the world’s largest regional theme park company, and CBS Films today announced an exclusive national partnership to provide Six Flags guests with a unique experience in support of CBS Films and Lionsgate’s latest horror movie release, Hell Fest, in theaters Friday, September 28, 2018. In collaboration with Hell Fest creators, Six Flags and CBS Films are launching new haunted attractions based on the movie at three Six Flags theme parks this Fright Fest. The company’s industry leading entertainment teams at Six Flags Magic Mountain in Valencia, CA, Six Flags Great Adventure in Jackson, NJ, and Six Flags Great America in Gurnee, IL, will transform haunted mazes into real life replicas of the movie’s most unnerving, goriest and most epic scenes.